Shingon Reiki is a Reiki style founded by Mark Hosak in 2005, that combines the traditional Reiki by Mikao Usui with Eastern and Western Wisdom Teachings of Tantric Buddhism, psychology and magic. The foundation of Shingon Reiki is Usui Reiki Ryôhô the traditional system, founded by Japanese Mikao Usui in 1922. This idea is the idea of Shingon Reiki by Mark Hosak. In his Shingon Reiki seminars as well as in his Shingon Reiki Master training, it is primarily aimed at the development of extra-sensory and magical abilities that are possible within the scope of Reiki. In addition to the traditional symbols of Mikao Usui more mantras and Siddham (symbols) are taught the Shingon school of esoteric Buddhism and applied. To be able to distinguish Mark Hosaks seminars from Usui Reiki, his seminars simply have a different name: Shingon Reiki. Objective here is that inherent in every being to recognize the „Heart of Enlightenment“ (bodaishin菩提心). In addition, one learns in Esoteric Buddhism a series of magical tools. Rituals and meditations healing with symbols and mantras that help to obtain the „Heart of Enlightenment“. Under „Heart of Enlightenment“ (Tib Buddhism. Bodhicitta), refers to the realization that the spiritual heart (kokoro心) is basically pure and enlightened. In addition, Mark Hosak discovered another finding: In „western magic“ is often spoken of a so-called „Od-force“. The word „OD“ stands for „the God Odin“. „Od“ means life energy. In the literature of magic is pointed out that one has to pay attention while working with rituals and acquiring supernatural powers, because of the possibility of losing ones own Od force. This notice gave Mark Hosak the idea of combining Reiki with „western magic“ to cancel the problem of energy loss and at the same time to work in a completely new way magically. Thus, a further component of Shingon Reiki was born. The basis of the Shingon Reiki is the traditional Reiki by Mikao Usui called Usui Reiki Ryôhô 臼 井靈氣 療法 to develop supernatural abilities such as healing with hands to spiritual development, for consideration in the context of spiritual healing, to activate the self-healing powers. In addition, further developments of Mark Hosak based on his many years of research with meditations and healing rituals of Esoteric Buddhism, that Mark Hosak explored in the context of his dissertation that he has learned in Japan in the Buddhist monasteries, plus the combination of Eastern and Western magic. 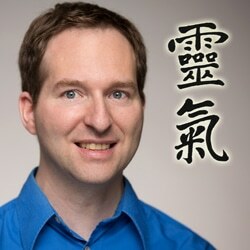 Mark Hosak developed the idea of Shingon Reiki in 2005. The first signs of this have already been published in 2004 in the „Big Book of Reiki Symbols“, where Mark the relationships between Reiki and Esoteric Buddhism extensively explains. He has since then been treating himself and friends. Until 2013 Shingon Reiki was not brought to the public because it was not Mark’s interest to create another new Reiki style. As part of his dissertation research on magic and Reiki and by the request of his friends as well as some Reiki students, Mark Hosak decided to teach Shingon Reiki in mid-2013, to the Master degree. Mark Hosaks Shingon Reiki courses include exciting, mystical and effective content from his research in the field of Reiki. Symbology and hermeneutics of the content of the new translation of the inscription on Usui’s memorial stone, spiritual work with Siddham symbols from the Shingon Buddhism Gumonji-hô (Venus Morning Star meditation), that in all probability Usui had practiced on the Kurama Mountain and the spiritual work with the Medicine Buddha, its symbols and mantras.